In the period over which the ideas for this project developed, the financial sector was in its pomp and discourses of neoliberal globalisation held sway; we were told that ‘the world is flat’. It was not monolithic, and there was some opposition. China was doing things its own way, parts of Latin America were asserting the possibility of more progressive alternatives, there was the Global Justice Movement and a host of local refusals. Inequality between people was also increasing dramatically, both between and within countries. And there were looming crises of climate change and of peak oil. In the UK, these were the dog-days of New Labour. The Faustian bargain of backing finance and using the proceeds to fund a public sector which was itself in the process increasingly subject to the ways of the market was showing its internal contradictions. The refusal to address the spiralling wealth of the very rich meant that, however many projects and schemes were aimed at the poor, deep inequality persisted. As Adonis and Pollard (1998) argued: ‘The rise of the Super Class…is a seminal development in modern Britain, as critical as the rise of the gentry before the English Civil War and the rise of organized labour a century ago, and rivalled in contemporary significance only by the disintegration of the manual working class’ (p.67), and Williams likewise estimated that ‘This has been a period of elite consolidation for which there is no parallel in the country’s history’ (2006, p.217). The dominance of finance became self-reinforcing – it did not itself invest in other parts of the economy, and its short-termism and exchange-rate politics actually undermined other sectors (Massey, 2007/2010). Likewise its concentration into south-east England sucked all resources (professional labour, for instance) into the maw of that part of the country and made growth more difficult in other regions. The ‘North–South divide’ widened. And so forth. And all under the shadow cast by the invasion of Iraq and the continued genuflection it implied by ‘our country’ (a usage that will here be questioned) to the USA. It was in these times and amongst these ruins of the New Labour project that this research was conceived. By the time we came to carry out the project the capitalist world was in full-blown financial crisis. And it is with this, and the possibility that the immediate crisis might lead to a more profound political questioning, that the engagement with the landscape became most preoccupied. Nonetheless, the questions of dwelling, belonging and mobility remained, in some ways exacerbated by the crisis. Indeed, their investigation turned out to raise conceptual and political issues that went far wider. We live, we are constantly told, in an age of flow. Yet there is about the film, certainly on first encounter, a stillness. So let us begin there. And with the conceptual arguments which that very stillness raises. The camera stays on the butterflies working the teasel for four minutes and 15 seconds. There are many such passages in this film. The camera while filming does not travel. And often, with the cowslips, say, or the marsh marigolds (with ducks), the rose and the bee, the white foxglove, and the butterflies with the teasel, there is not much movement in the image either. Certainly there is no movement in the sense of ‘mobility and displacement’ which is one aspect of what this project was supposed to be about. But these long takes are not about stasis either. Stuff is happening. The plants are getting on with their business. The bees and the butterflies are working them. The air is busy with activity. ‘Robinson had once said he believed that, if he looked at the landscape hard enough, it would reveal to him the molecular basis of historical events, and in this way he hoped to see into the future.’ Just before we meet the teasels and the butterflies we have learned of the longer historical story: ‘a 40-year study of plants, birds and, in particular, butterflies in Britain had given a firm indication of approaching mass-extinction’. But the moments spent with the teasel tell of what it takes to survive, just to go on, from season to season. The work that has to be put in, for both the teasel and the butterflies. These long takes give us, in the midst of the rush and flow of globalisation, a certain stillness. But they are not stills. They are about duration. They tell us of ‘becoming’, in place. In a previous piece of research (For Space, 2005) I had urged the need for a reconceptualisation of space. I argued at length against the characterisation of space as a ‘slice through time’ in which there is no dynamism. There is a long and persistent history of this counterposition of space and time, in particular through the conceptualisation of space as the absence of time/temporality. Henri Bergson is a particularly interesting exemplar, in part because he is currently so influential, in part because much of what he says is so invigorating, and in part because of his, characteristic, association of space with representation. Bergson’s passion was for temporality, for ‘duration’, and his commitment was to resisting what he saw as the deadening of time – the squashing of its continuity and flow. The culprit, for Bergson, was science and representation which, through their categorisations, their tying of things down, their fixing of things, deprived them of all vitality. In Creative Evolution he writes: ‘The more consciousness is intellectualized, the more is matter spatialized’ (1911/1975, p.207). And so the journey becomes the path and, we might add in the present context, the landscape becomes (reduced to), for instance, the map, or the photograph, or even the film. It is indeed impossible to produce movement/life/becoming out of a series of static cross-sections, even multiplied by infinity. ‘It is…because the continuum cannot be reduced to an aggregate of points that movement cannot be reduced to what is static. Continua and movements imply each other’ (Boundas, 1996, p.84). So far so good. It’s the last part of Bergson’s observation that is problematical. For he calls this process, of taking the life out of things, spatialisation, and – yet more problematically – this is carried over into his implicit characterisation of space as such. In Time and Free Will, Bergson writes: ‘we cannot make movement out of immobilities, nor time out of space’ (1910, p.115, emphasis added). It would be better to argue quite differently. Precisely because ‘we cannot make movement out of immobilities’ we must not conceive of slices through time as immobilities. Indeed such a slice can only be a representation. In nature, as Whitehead observed, there are no stills. If the instantaneous moment were not itself imbued with temporality there could be no temporal trajectory. Correspondingly, for time/temporality/becoming to exist, space has to be imbued with the temporal. As a slice through time, space is a dynamic simultaneity and that is quite different from a stasis. We must, then, re-write Bergson’s dictum. Rather than ‘we cannot make time out of space’, it is that for there to be time, space must itself be imbued with temporality. Space as a simultaneity indeed, but a cut through ongoing histories. Not a surface but a simultaneity of stories-so-far. The characterisation of space as stasis and as a surface, then, derives from the long equation of representation with spatialisation. Representation as that business of setting things down side by side. Take, for instance, Michel de Certeau, a writer much referenced in artistic and cultural circles. For de Certeau, the emergence of writing and of modern scientific method inevitably entailed the obliteration of the temporal. Space then becomes the given, the established. And the central burden of his book The practice of everyday life (1984) is to invent ways of reawakening that temporality. To do this he invents his opposition between strategies (space; established power) and tactics (time). And the romance of the little tactics of the street has been much taken up by cultural theorists. But it is based on a false opposition, between space and time, and the consequent misleading characterisation of space as the immobile realm of established power. All this from understanding representation as spatialisation. Indeed, the very equation of representation with spatialisation might be questioned. What is at issue in representation is not in fact the spatialisation of time but the representation of time-space. This is as true of this film as of any representation. Moreover, its method is the assembly of pieces of film in a spatial sequence. But its form evokes space/place/landscape as alive with temporalities. And this, I want to argue, has political implications. That long takes are not stills thus chimes with those philosophies, including Bergson’s, which insist that all is process. That Being itself is Becoming. It also chimes with that general understanding of the world in terms of its constitutive energy, an energy that is constantly formed and moulded into constituted things. Now, for reasons no doubt not unconnected with the present globalisation, this general ontological stance has been, among many of those who have taken it up, transformed in two ways. First, it has become widely assumed that constitutive is to be preferred to constituted, even to the latter’s exclusion. An ontological understanding has taken on a normative form. Thus Hardt and Negri’s urging of us to abandon all those old certainties of containment – from nation states to trades unions but including most importantly here place and territory. In the oppositions between the uncontained and the contained, the smooth and the striated, the deterritorialised and the territorialised, the positive weight is now popularly put on the first term. And in recent years in much of cultural studies and the arts there has been a prioritisation of movement/flow above all else (and an apparent assumption not only that this is the ‘progressive’ thing to do but that doing this makes a work progressive). But this is to fall also into the second slippage. For what is a general ontological position has here been overwhelmingly imagined in spatial terms. Hardt and Negri are again only the most explicit advocates of this transformation: ‘This ontological relation operates first of all on space’ (2001, p. 361, emphasis added). For Hardt and Negri this reading results from a political assessment, but more generally there has evolved an imagination in which thingness, containment and constituted power are equated with place and territory while process and change are equated with geographical flow and migration. And it is the latter – flow, mobility, migration – that recently has been given political priority. This relates directly to our concerns with understanding landscape. For one thing, it has led to ‘the migrant’ becoming the iconic figure of our times (and above all indeed the international migrant since only they cross the boundaries of constituted space). What is happening here is that the couple stasis:change has been reduced to geographical settlement:geographical movement. Which is not what Bergson was getting at at all. The teasels are not migrating, but they are certainly ‘becoming’. Just like the definition of becoming in Hardt and Negri’s ontology, the story of ‘displacement’ has in recent years also been cornered by those who would emphasise physical movement from place to place. It was in the context of this discourse associating displacement with global movement that our project was initially framed (we have lost our places and our placedness as a consequence of global mobilities). It was not long before we rejected its terms. It is in no way to downplay the effects of mobility in this classic sense to argue that there is a bigger displacement against which it must be set, the recognition of which might bring together in common anger those whose displacement has happened through migration (or the geographical movement of others) in the now-classic sense and those who have been equally displaced while staying still, as the primroses by the roadside look set to be. You don’t have to move to be, or feel, displaced. It can happen through dispossession. In the film, the struggles over enclosure, for instance, are about just this. At one point in the project, Patrick K and I decided it would be good to spend more time together in parts of the landscape he had engaged with. And so we set off. The film, as we have seen, is a series of takes at particular locations. The camera comes to rest, and films. Of the journey between these locations we see nothing. Doing the journey on the ground, of course, we did. We went along smooth roads, and lanes, and through small contented villages. These are the elements of this landscape that are normally taken as iconic of this part of England. Indeed often enough as iconic of England tout court. There are none of these, and barely a glimpse of a thatched cottage, in the film. We had no desire to produce yet another easy critique of nostalgic iconography. But this side of the landscape that is not in the film brought me up against another of the concepts that were pivotal in the initial formulation of the project: belonging. This is most easily told in personal terms. The landscape of these villages is supposed to stand for me, in the classic iconography of the nation. Yet I feel utterly and totally – and both wilfully and not – excluded from it. It is a matter, overwhelmingly, of class: I come from Wythenshawe, a large council estate in Manchester. (The Duchess of Somewhere once went there, in one of those TV programmes where those who are ‘more fortunate’ visit the benighted and try to gee them up. There were reports that ‘the locals’ were not best pleased. And David Cameron met his match here too: gliding through the place not long after urging us all to hug a hoody, or some such, he was photographed smoothly unaware that behind him a young denizen of this place, appropriately hooded, gave him a V-sign.) I may ‘belong to’ this other, comfortable, part of England in the sense that I am owned by it – must obey its laws, conform, more or less, to its customs and so forth, have been inculcated into its narratives, and may participate in its democratic processes however attenuated – in return for the not inconsiderable benefits of being one of its subjects (we cannot – yet? – say citizens), but it does not in any sense belong to me. This part of England, and its little villages and grander estates, represents (one face of) the enemy. I had felt the same thing while at Oxford University and had the same wrestle there, agog at the beauty of Radcliffe Square in the lamplight at night and angry and alienated at what it stood for. Feeling like a space invader. These are the wrenchings of a displacement effected by class. They reverse the terms of the usual question of belonging in relation to place and landscape. Rather than that dwelling-saturated question of our belonging to a place, we should be asking the question of to whom this place belongs. Who owns it? Materially, and in terms of power, the ‘national’ working class (of whatever ethnic origin) has no more ownership than does the recent migrant. There is common cause here. Robinson set off for the Pelican Inn, scene of the devising of the Speenhamland system, intending to arrive there on the 6th of May, the anniversary of that historic meeting. The Speenhamland system, argued by Polanyi to be crucial in the contradictory movements of market society in England and thus at ‘the origin of twentieth-century catastrophe’, ‘offered landless agricultural workers some protection from the displacement intended by the changes to the Settlement Act’ (my emphasis). Indeed. On the 6th of May 2010, the subjects of this country elected the most elite – in class terms – government in years. In the months before the election it was reported that entry into the professions was overwhelmingly confined to those whose parents were already of that class. In the months after the election, research for the Sutton Trust found that ‘parental background remains a much more significant determiner of children’s life chances in the UK than elsewhere’. One can legitimately ask to whom this place belongs. This reversal of the terms of belonging is there in the film. Heidegger’s notions of dwelling and of simple oneness are a fallback desire, evoked perhaps by a well once ‘much resorted to by scholars’ and still visited today, or by the designers of food packaging (the dwelling evoked on the package may be in the Black Forest, while you buy it here in Lidl, a global company, in outer Oxford, and pick up your Putinoff vodka at the same time, but buying (into) that reference to authenticity is not without its charge). The house that Robinson initially haunts recalls in its neogothicism the conservative romantic mediaevalism of Pugin and the Oxford movement. It was in Oxford, around which Robinson circles, that was centred that defence ‘against the insidious inroads of liberalism, Dissent, secularism, agnosticism…’ (Eagleton, 2010, p.10). As Hobsbawm has it, ‘the architect Pugin and the ultra-reactionary and catholicizing “Oxford Movement” of the 1830s were gothicists to the core’ (1962, p.320). This house of reactionary romance is bit-by-bit restored, until Robinson has to leave, to find ‘another ruined dwelling’. This time, though, it is signalled by a pair of trainers slung from the overhead wires – which ‘he took to be a sign of hospitality to pilgrims’. The in-principle possibility of Heidegger’s notion of dwelling, and of that notion of belonging to place, or even its desirability, is undermined throughout the film. 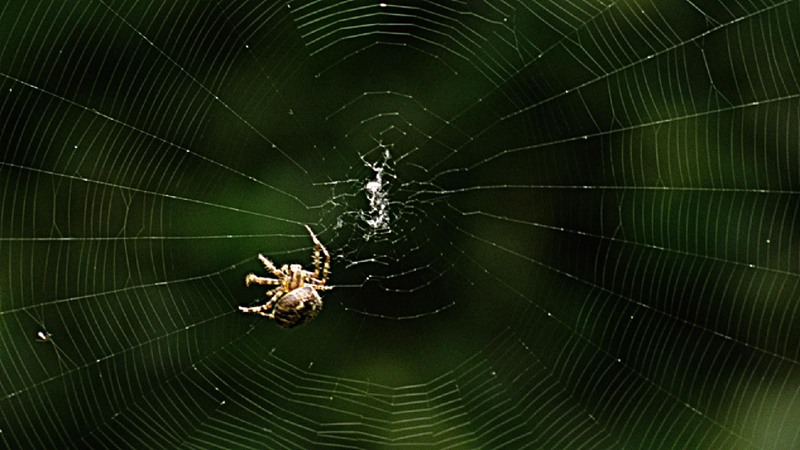 On the contrary, Robinson keeps running up against exclusion and a landscape shaped and used by wider forces, experienced as absent presences: big systems, huge infrastructural networks, the military, the financial crisis itself, closing in as the spider weaves its web. The complexities of global capital; the pretensions and attendant subordinations of geopolitics. Central here is the presence of the USA. The question hovers: does this landscape belong even to the United Kingdom? This could be read in a ‘Little Englander’ way, and set off an imagination of inside/outside. There is certainly a persistent hostility to the UK’s abject obeisance to the United States of America, and its military strategy around the world. But this is a particular politics, not a question of inside/outside. Indeed at a number of points it is clear that that other ‘outside’ – Europe – might be welcomed. Nor is this openness new: the opennesses of the past from the Romans on are liberally referenced. And it is about exclusion. The story of Greenham, for instance, and the return to commonland status. Or the detailing of the dispossession of the public through privatisation: that this piece of the landscape is now part-owned by a pension fund from Canada, for instance. By the second half of the film, the public is forced to rescue financial institutions from the disaster they and their markets have created. And people are taking their money ‘to the Post Office, and the Co-operative Bank’. This is not local protectionism but a critique of dispossession. Even more significantly, this is a rejection of that protective localism which sees the local as simply good, to be defended against the global forces supposedly ranged against it. Here, on the contrary, in the heart of the Home Counties we face the complicity of the local landscape in damage and aggression beyond its confines, out in the global world – from area bombardment, to oil-intensive agriculture, to Libya and Iraq. The ‘openness’ of the local landscape goes both ways, and neither is simply benign. The brief moment of explicit contemplation upon a possible alternative future focuses on reforming landownership and democratic government, and the development of a form of industry and agriculture less based on oil. The location for these musings is the quarry at Shipton-on-Cherwell, geographically right by, and narratively intertwined with the film’s preoccupation with enclosure – another form of displacement and dispossession. The rising by Bartholomew Steer and his fellows had been provoked by facts and fears of enclosure, the effects exacerbated by the scarcity of grain. And again this is no story of a romanticised (Heideggerian) localism. Steer had hoped that people would join in from a wide area round about, and Walter (1985) documents the numerous routes by which in those days news and plans might travel. This was about connections, not a bounded localness. Indeed the place that was chosen to be the centre of the rising was Bletchingdon, the focus of a ‘constellation of roads and ways…along which people and ideas could move’ (Walter, p.102). It seems significant in relation to the structure of the film that these roads and ways ‘all fed into the main London road running through the parish, bringing news of the city and knowledge of the 1595 disorders and later discontent upon which Steer set such store’ (p.102). This road is the B4027. The B4027 runs through the film as well. We first meet it as ‘what had once been the coach road from London to Aberystwyth’, and Robinson spends a lot of time in its vicinity: ‘He was interested in the coach road. He sensed it might lead him to an important destination’; our first contemplation of wheat comes as Robinson lingers in the area – and the narrative voice speaks of a doubling in its price (‘There had been bread riots in Egypt, and several other countries’); and it is on this same road that Bartholomew’s rising failed to travel that the film ends: ‘the last images he made were of a milestone on the Aberystwyth coach road, which measures 58 miles to London’. Perhaps it is a road we should be taking now. In its own immediate terms Steer’s rising failed (though it was to have historic repercussions). The man’s complete exasperation at the difficulty of getting others to join in has echoes down the ages. Perhaps the most famous cry from the Spanish Civil War is La Pasionaria’s ‘es mejor morir de pie que vivir de rodillas’. In Oliver Stone’s film South of the Border, about the recent rise of the Left in Latin America, Hugo Chávez insists…we have to do something, rather than live in servitude. His reference point is Che Guevara, who said the same. For Bartholomew Steer, on learning that in spite of the current suffering the people of Witney were probably not going to rise up and join in revolt, it was: ‘if all men were of [that] mind they might live like slaves as he did. But for himself happ what would, for he could die but once and…he would not allwaies live like a slave’ (cited in Walter, p.101). Ask not ‘do you belong to this landscape?’ but ‘does this landscape belong to you?’ This argument developed during the course of the project, and the making of the film was one of the ‘research methods’ through which it emerged. But there is in the film also the argument that the film itself can be an aid to reversing those terms of belonging. We see the landscape differently: not closed down into a familiar satisfaction but opened up to reinterpretation. The team that edited Robinson’s films was carrying out research ‘based on the transformative potential we attributed to images of landscape’, and in his notebook Robinson himself had written of ‘a Great Malady, that I shall dispel, in the manner of Turner, by making picturesque views, on journeys to sites of scientific and historic interest’. Shelley was writing after Peterloo, in Manchester. It was in these regions of the North of England that the new industries were growing in the early nineteenth century, and the new industrial capitalism. Distress and discontent were widespread in the country, and ideas from the French revolution, just a few years earlier, were feeding new demands for liberty among ordinary people, and alarm within the establishment. In the agricultural regions of the South there was no opportunity for work in the new industries (horrendous as the conditions in the new mills were). Indeed, some domestic industries, such as textiles, were being lost to the new factories. As Hobsbawm and Rudé have it, in agriculture there was ‘a low-wage South and a not quite so abysmally paid or treated North’ (1969, p.19). Today’s villages of Berkshire and Oxfordshire lie on land which, in the early nineteenth century, was home to desperate agricultural poverty. Pause for a moment, as the camera does, at the rural road sign. We have arrived here from Aldermaston and the sign reads, in shock red, AWE. We have heard the story of subordination to the USA, and of a women’s peace camp and contests over access to land. 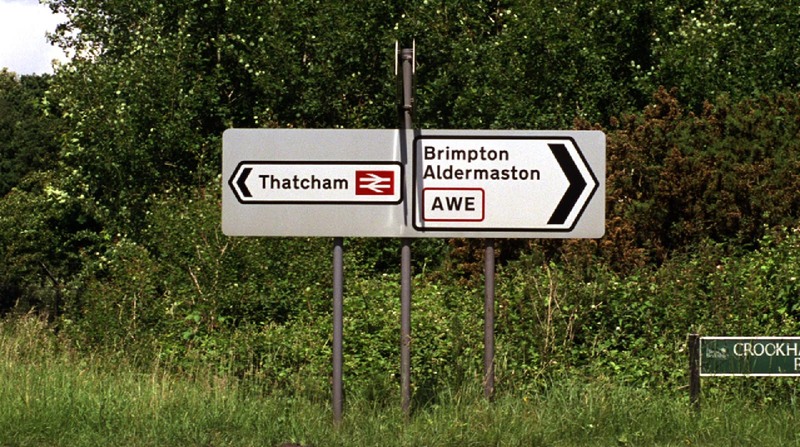 The sign also points to Thatcham, a contented-sounding name. Thatcham was, as we are told, the place where not long after Peterloo the Swing Riots took off in Berkshire. The village was a nucleus of militancy (Hobsbawm and Rudé, p.81). Already in 1800 there had been a dispute there, when 300-400 labourers had gathered to ask for a rise in wages; either that or cheaper food. This raising of voices had led to riots around Newbury and thence ‘spread its influence deep into the Hampshire countryside’ (Hobsbawm and Rudé, p. 135). Now, in 1830, Thatcham was a starting point in the Home Counties for the movement of agricultural labourers known as the Swing Riots. In November that year the demand was for higher wages and work for the unemployed. This was a movement that was picking up on events in Kent and a scatter of other places in February of that year and that swept through the South-East, through Hampshire and the West Country, the Home Counties into the Midlands, and through East Anglia. The word spread, and ‘local people’ learned from other local people. (This was not local containment.) The context was international too. Everything had been fluctuating: the price of bread, the wages for labour, the very availability of work – changes brought about by unhelpful weather in part, but also by relations with France. ‘The country’ had been at (counter-revolutionary) war against the French and while during the war wages were higher and food more plentiful, both fell away dramatically afterwards, leaving destitution. Comments Thompson, in words that resonate with Shelley, and that raise again that two-sided question of belonging: ‘One recalls with difficulty that England belonged to the labourers as well’ (p. 246). The retribution for this challenge to the traditional order of belonging was vicious. In Berkshire 78 Swingrioters were gaoled, 27 sentenced to death (though only one executed). In Oxfordshire 23 were gaoled. Fifty-eight people from these counties were transported. Of them, 40 arrived in New South Wales and 15 in Van Diemen’s Land (Tasmania today). Causes and consequences too well overflowed the local. As Hobsbawm and Rudé have it: ‘What began at Orpington and Hardres [in Kent] ended in the jails of England and the convict settlements of Australia’ (p. 91). Such was this part of rural England less than two centuries ago. The methods the Swingrioters had used were various: threatening letters, meetings, riots, rick-burning, the destruction of machines. Threshing machines were destroyed in Thatcham and in the parishes round about. The movement initiated by the villagers of Thatcham ‘was taken over, and transformed in the process’ (Hobsbawm and Rudé, p. 136) by labourers from other villages, who marched from farm to farm demanding food and drink and higher wages. At 11 o’clock on the 17th they broke a machine at Aldermaston, and returned the next morning to break some more. ‘[M]ustering their forces that afternoon in Aldermaston Park, they boasted of having destroyed 33 machines in as many hours’ (Hobsbawm and Rudé, p. 136). The very notion of ‘landscape’ seems to induce an effect of smoothing. The very fact of visual continuity implies a kind of present reconciliation (Massey, 2006). In this guise it resonates with that notion of space as a simple surface. We travel across landscape; we travel across space. This film could be seen as such a travelling. It could seem to be precisely that form of representation as spatialisation. It spaces out the landscape. The camera films from a constellation of locations from which we can piece the landscape together. But the form of the film itself tells us that this is in no sense a simple surface. The camera does not film while moving. It films when it stops, and at each point when it does so, we dwell upon a story. We pause at a horse chestnut tree. It has a history. These trees were brought to northern Europe, we are told, from Turkey (around the time, as it happens, when Bartholomew Steer was trying to organise his uprising, proclaiming the politics of Cockayne). They are also bound up in a history that led to ‘British’ support for Jewish settlement of Palestine. Bound up, in other words, in a region with an unknown and certainly contested future, yet to be made. An ongoing story. We stop next at the Pelican Inn, site of the meeting at Speenhamland, key moment in the contested emergence to dominance in the UK of capitalist market relations, and then we stop at Greenham Common and at Aldermaston. At Silchester. And West Green House whose story links back to St. Augustine of Hippo, via Rabelais, and threads forward to Lord McAlpine of Margaret Thatcher’s Conservative Party, and neoliberalism. The camera stays still at each point; it concentrates; in some small measure it gives each its due. And at each point we are in the midst of an ongoing story. This is not a journey across a surface envisaged as a smooth continuity. Landscape here is not allowed its smoothing effect, its subtle operation of reconciliation. The conventional continuity of landscape, and of the founding conception of space upon which it rests, is punctuated by a multiplicity of stories. This, for me, is the significance of the spatial assembling of these pieces of film, and of the fact that while filming the camera is still. It brings us the simultaneity of stories-so-far that really is that slice through time that is space. Not a stasis, but a dynamic simultaneity. The space-times of this aspect of the construction of the film in themselves bear witness to a way of understanding landscape that coincides with this conceptualisation of space as imbued with temporality. First, this is a temporal narrative in the obvious sense that it is a journey. And the sequence of the film reflects the sequence of the journey; indeed the film has ‘chapters’ following the sequence of months, from January to November, of Robinson’s travelling. This forms a kind of temporal framework. But within the framework, both spatiality and temporality are quite complex. Thus, second, spatially this is not a linear ‘route’. The different forays Robinson makes cross-cut each other, turn back, revisit, set locations in different contexts. What we are given is not a spatial forward march to match the framing temporal one. Rather this is a constellation of locations within a larger landscape, which we are cumulatively enabled to construct. (This is even more the case in the DVD version where, perhaps even with map to hand, we can disassemble and reassemble the geography – and indeed the temporality – of Robinson’s wanderings.) Moreover, third, what the camera comes across is only rarely a wide picture of a ‘landscape’ but rather lots of distinct, though sometimes related, specific histories. Multiple temporalities. The structure of the overarching narrative of the journeys, in other words, is actually the fact of intersecting with a multiplicity of other stories. The temporality of the month-by-month exploration is not a classic ‘plot’ but a process of discovery of stories. The landscape, too, is a simultaneity of stories-so-far. Fourth, of course, this discovery of stories, and what they tell us, allows us to build a political argument. Now, it is important to be clear what is not being said (or done) here, for there are many well-intentioned but perhaps too easy critiques of landscape with which it might be confused. First, this film disallows landscape’s effect of reconciliation, not because the stories we come across are so often ones of conflict, oppression, rebellion – that is part of another argument, about ‘content’, that we shall come to later – but because of the very form of the film and the (re)conceptualisation of landscape that it enables. Second, nor is this method that of the excavation of the exploitative history upon which the landscape is built (these empty moors the effect of clearances, this city built upon the trade in slaves). These are important moves, but they can have a tendency to leave the horror in the past (we don’t do that kind of thing now) and even to pacify us (feeling good for having acknowledged this past). Better still would be to address the present, for these are ongoing stories. Third, and relatedly, nor does the form of this film conceptualise the landscape as a palimpsest, in which layers of history simply overlie and partly obscure and erase ones that went before. There certainly are erasures here – there is no sign by which the passer-by might know the crucial role of the Pelican Inn in ‘the great transformation’ that brought us to today; Enslow Hill, where men were executed for daring to propose another way, is now not named on any map. It is also important that here the erasures we are asked to address are not only of oppressions that might provoke a retrospective guilt or, better, responsibility. They are also of the struggles of people who might have been us, over the making of this landscape. The story of our own dispossession. And this too is ongoing. Moreover, the relative invisibility of this struggle is an element in our displacement. Nonetheless, in relation to form, the imaginary of palimpsests is perhaps too horizontal (just layer upon layer); and perhaps again too easy (it allows ‘us’ to criticise ‘them’ for erasure, but it doesn’t really challenge us, now). In this landscape, in contrast, the stories shoot out of the soil, speaking to today. And finally, this is not the same as simply saying that the landscape is not static; that it is always ‘in process’, and so forth. Of course it is. The question is how we conceptualise that. What is at issue here is an insistence on the contemporaneous multiplicity of stories. It challenges perhaps that very notion of a landscape as a oneness. To walk across a landscape with any degree of awareness is to pick your way across the locations of a host of unfinished trajectories. Their unfinishedness addresses our today. This, then, is about the very reconceptualisation of landscape and in a manner, I would argue, that is more demanding politically than the more usual critiques. It is in line with what Bergson later came to do, to acknowledge the duration in external things (not just one’s own consciousness), in the multiplicity of the world around us. It is about coevalness, the recognition of the contemporaneous co-existence of other things (and a refusal to reorder contemporaneous difference into temporal sequence – backward, developing, primitive, pre-modern, residual – and thus to the past – even when they are ‘ruins’). This is about the present. And it matters how we imaginatively reorganise all of this multiplicity of stories into a ‘landscape’. On the one hand there may be that smoothing operation that effectively evades the challenge of the multiplicities of space. On the other hand, as here, there is an acknowledgement of the temporalities of that space, which alerts us to potential questions for today. Michel de Certeau, as we have seen, decried the deadening effect of scientific discourse, and called it spatialisation: ‘However useful this “flattening out” may be, it transforms the temporal articulation of places into a spatial sequence of points’ (p.35, emphases in the original). In this way, he says, ‘time, that fugitive element’ is controlled (p.89). In de Certeau’s view of space it is impossible to be surprised: ‘In this way, surprises are averted’ (p.89). With that view of space he could not find himself at West Green House in the middle of that story that stretches from St. Augustine, through Lord McAlpine, through now. In total contrast, openness to the surprises of space is the method (as well as an element of the meaning) of this film. And the recognition of this punctured character of space in fact, rather than asking space to stand for representation, points to the ultimate unrepresentability of space itself. A confession – and a further point. In early viewings of the visuals, along with the script, I found myself restless in the detail I was offered of the history of Hampton Gay (we were right at the end of the film). But it was wrestling with that feeling that made me understand, not only (that it could be about) the need to give things their due (which of course we can never fully do; it is an attitude of mind, a stance, not a task to be completed), but also that my mildly irritated ‘so what?’ was part of the point (or, at least, it became so for me). All that detail is (part of) the story of the trajectory we have come upon. It is a story that has links to other stories in this landscape (the train crash harks back even to the experiments of Boyle and Hooke at Cross Hall, where the Shelley Memorial now stands…). But there are also threads that have no such links. Loose ends. This is not the closed coherence of a synchrony in which all elements are (already) connected to each other. This is space as open and in the making. So when occasionally the camera does step back to view a wider landscape there is an effect, partly because we already know some of its component stories, of disruption rather than smoothing. The stories we stumble across in this landscape are often entangled with each other, but they are autonomous too and lead off in other, unrelated, directions. There are always loose ends in space. And those loose ends give space its openness to the future. This is not some comforting, already completed, holism. This is space as a dynamic simultaneity, always in the process of being made, and open to alternative ways of being made. It is a responsibility to make and there are choices to be made. The intertwining of times within the film presses the point home. The past as a resource for the future. The present crises of finance and of food intertwined with stories of old rebellions, the Failed Road of Bartholomew Steer right by a quarry where another road might be initiated…there are always alternatives. So stories spiral out of the landscape, and we shall pick some stories to follow. There could be others. We could follow the story of dispossession of the land under the Enclosure Acts through Thomas Spence and his call for parish ownership, and from there across the Atlantic, for example to Jamaica, where Cobbett’s Register was circulating among freed slaves and had published Spence’s Plan. Spence himself wrote in defence of indigenous landownership in the USA, and knew of the battles of indigenous peoples in Central America. These were the years of the many-headed hydra and the ‘revolutionary Atlantic’ (Linebaugh and Rediker, 2000). The question is what happens when we take seriously the ongoingness and multiplicity of the stories that puncture this landscape? It is not just the recognition of the oppressions and exploitations that have gone before. It certainly includes that: the robbery of the English landscape by an elite; that this is the foundation of these monied acres. But it is also the understanding that these stories have not finished. This is about today. There clearly were alternatives in 1830, the year of the rebellion on Otmoor, and a year that figures pointedly in the film. The year of the Swing Riots was also one of revolutions in France and Belgium, the Liverpool–Manchester railway was opened (and a meteorite fell at Launton, near Bicester). The wave of rural rioting that swept through this landscape then was ‘the last labourers’ revolt’ (Hobsbawm, 1962, p. 154). The focus of social conflict was moving away, to industry and the fast-growing cities. The whole balance of class forces was shifting. By 1830 the new industrial bourgeoisie had thoroughly won out over aristocratic power in Western Europe. In Britain and France a new independent industrial working class was emerging, with the beginnings of political self-awareness. By the time of the revolutions of 1848 the fulcrum of social conflict in Europe was between capital and urban labour. This was the age of the establishment of empire too. ‘By 1848 nothing stood in the way of western conquest of any territory that western governments or businessmen might find it to their advantage to occupy, just as nothing but time stood in the way of the progress of western capitalist enterprise’ (Hobsbawm, p. 16). And it was a period of opening up, of the breaking down of old hierarchies and fixed positions, of the beginnings of the refusal of old deferences (though we know, nearly two centuries later, how much of all this remains). It was the period of the birth of liberalism, of the belief in market forces and the self-regulating nature of a market economy, and of the mistaken view that we can separate the economic (seen now as a force of nature) from the political. (This we most certainly have inherited.) It was in the 1830s that ‘economic liberalism burst forth as a crusading passion and laissez-faire [became] a militant creed’ (Polanyi, 1944/2001, p. 143). The protestors at Otmoor, and the crowd at St. Giles’ Fair, were caught up in all of this. For to secure this future of capitalism and market forces, land and labour (and money), like everything else in this envisaged utopia, had to be turned into commodities. Robinson knows of this utopian nightmare, for he has been reading Karl Polanyi’s The Great Transformation, about just this period. Land and labour can not be commodities like any other. Commodities, in the full sense, are not just things that are bought and sold; they must also be produced to be bought and sold. This is patently not true of either land (or, more broadly, ‘nature’) or labour (as Polanyi has it, ‘labor is the technical term used for human beings’ – p. 79). Both are given to the system from outside. They are ‘fictitious commodities’. Yet upholding this fiction is vital to the functioning of a capitalist market economy. And producing this fiction out of pre-capitalist traditional society could only happen through wrenching social change. That was what was going on at Otmoor. Take land. The transformation of land into private exchangeable ownership began early in Britain. The enclosures against which Bartholomew Steer protested were part of the Tudor wave of such appropriations, the Enclosure Acts between 1760 and 1830 a fierce consolidation of a process already under way. Under these Acts, some 5,000 enclosures broke up about 6 million acres of common fields and common lands and took them into private ownership. As in the Tudor period, it was a process of ‘improvement’, an essential element in turning farming into an industry like any other, and in the later period of supplying the growing towns with raw materials and food. The old, uncommercial ways had to be swept away, whether these be the traditions of native Americans across the Atlantic (or of those in the new colonies to which the rioters were transported) or the common grazing rights of the people at Otmoor. The reading of the Riot Act at Crookham House, the persistent discontents at Thatcham, the winning of higher wages at Speen, as well as the events at Otmoor, were thus small moments embedded in, and illuminating of, wider convulsions. Caught in the shift between social orders, these people were on the whole resisting change, wanting to cling to the older certainties (even if, on occasions, they appealed to French revolutionary liberties). And it wasn’t just the landless who resisted. Some of the owner-farmers and even, as we hear, the local yeomanry would make common cause against the destruction of old ways, against the threatening dominance of the new industrial capitalists. It was a moment of real dislocation. But that was what was necessary to make a social reality out of the fiction of land as a commodity. The resonances with today are evident, and the intersections of historical times within the film enjoin us to explore them. There is, to begin with, one particular resonance to excavate – about political strategy and political rhetoric – which takes us back to this question of dwelling and mobility, and space. The protestors at Otmoor were objecting to the enclosure of a wetland common and in doing so they ‘destroyed every fence and hedge that they encountered’. The battle against enclosure runs through the film, as does the struggle for access and for common land. At Aldermaston, for instance, and at Greenham. The wandering multiplicity of the Ridgeway paths up until the eighteenth century ‘was located in the era of parliamentary enclosure, to keep livestock out of newly cultivated fields’. The multiplicity was organised, regimented into one. ‘Horizontalism’ – the preference for the smooth as against the striated, for constitutive space as against constituted – became an issue for us too. The apparent freedoms of smooth space (‘Fay ce que vouldras’) chime perfectly with the supposed new world of flows. Should we abandon all notions of containment? It is a position that can be contested. And the debate is there in the landscape. First, fences and borders can be protective too. The regimentation of the Ridgeway paths to protect the enclosed crops you may object to, but what of the invasion of the global South by multinational corporations, or of the forests of the Amazon by cattle ranchers? The word ‘protection’ should be rescued from the bad name it has been given, through the persistence of the dominant political discourse of ‘free trade’ in the era of neoliberal globalisation. And on a somewhat less epic scale, many of us today would equally object to the grubbing up of hedges – haven of birds and bees and biodiversity. Second, what the people of Otmoor were wanting to reclaim was not just the common land but precisely the comfort of the old containers (though these had their own negativities and contradictions). This turning of land into a commodity meant they lost not only access to land but also ‘their other bonds’ (Hobsbawm, 1962, p. 187), and this was frightening. Of course, this desire for known securities meant that they were rarely revolutionaries, but it is not to be dismissed. Third, anyway, as we have already seen these containers were never simply closed – the very opposition between total closure and total opposition is false. Territories are embedded in flows; and flows could not be without territories. Space, like landscape, is always striated. There will always be boundaries and borders (if not hedges). The real political questions concern their roles and functions and the degree and nature of democracy in their constitution. To call simply for an end to all fences is both to ignore the consequences for those who would thus be exposed, and to evade responsibility for their unavoidable construction. Remember that the people of Otmoor, who tore down the fences and hedges, also ‘walked the circumference of the moor, “possessioning” it, in accordance with a local custom’. The battle over enclosures was not about the abstract spatialities of smooth and striated. They themselves have no necessary political content. Rather, as indeed Polanyi writes, what was at issue in these particular enclosures was that they were ‘a revolution of the rich against the poor’ (p. 37). They were about power, and inequality, and the question of to whom this land(scape) would belong. In fact, enclosure prompted its philosophical opposite – mobility. Territory and flow, movement and rootedness, constantly require each other. The enclosure of land in the eighteenth and nineteenth centuries set the rural labourers free; deprived now of all other subsistence, they could move around the country in search of work. ‘Speenhamland’ was a crucial moment in the tortured societal negotiation that this entailed, between long-inherited social bonds and the liberty of migration. Robinson ‘had read that one of the factors that enabled industrial capitalism to develop first in England was the mobility of the previously settled agricultural workforce’. The Settlement Act in 1662 had pretty much bound the labourers to their parishes, establishing at the same time the systems of relations and responsibilities whereby they would be (minimally) maintained. By 1795 this settled system was under strain, and there was pressure from the urban industrialists for more workers, so the rural hierarchies and responsibilities were abolished, and labourers were free to move. But these were hungry years, and the ‘freeing up’, along with the abandonment of social bonds, presaged destitution and the break-up of the familiar rural society. In the face of dearth the gentlemen of Speenhamland had devised a system of poor relief: a sliding scale of subsidies in aid of wages, and linked to the price of bread. On his first foray out of Oxford, Robinson comes upon the sign for Newbury, where Speenhamland lies, and later the profile in lichen draws him to the Pelican Inn. Polanyi argues that Speenhamland was ‘society’s’ response to human suffering, while the creation of markets, such as the market in labour, was a deliberate act aided by the state. Depriving people of all access to survival other than the wage was to turn them too, as labour-power, into a commodity. But, like land, labour is a fictitious commodity, and the social misery entailed in the effort to produce that fiction was part of what provoked society’s responses: ‘the commodity fiction disregarded the fact that leaving the fate of soil and people to the market would be tantamount to annihilating them’ (p. 137). The way that argument is often read today is that the market may be barbarous but it exists, and so we must intervene in it, to soften its impact. (There are, of course, some who argue against even this.) But this is to get things all wrong. It is to accept the background implicit assumption that market forces are somehow natural – precisely, as we have seen, a theory that took hold in the time of Otmoor, and that continues to be repeated and repeated endlessly today so that it has become our common sense. Polanyi argues the opposite: market forces and all those ‘freedoms’ that are said to spring forth in the absence of ‘regulation’ are themselves the product of state action. The market is no more natural than what, in our disingenuous linguistic entrenchment of this peculiar view of the world, we call intervention. We witness the imposition of market forces today as the IMF and the WTO prise open the economies of the global South – in the name of the mobilities of free trade. ‘There was nothing natural about laissez-faire’, writes Polanyi, ‘laissez-faire itself was enforced by the state’ (both p. 145). Historically indeed the introduction of laissez-faire was accompanied by enormous increases in state activity, in rules, regulations and administration. And ‘the market has been the outcome of a conscious and often violent intervention on the part of government which imposed the market organization on society for noneconomic ends’ (p. 258). That last bit is particularly telling…‘for noneconomic ends’. The social purpose to which economic theories are put (and in the context of which they are often developed) is sectional interest – they are mobilised by those who stand to gain. Trotted out when needed to legitimise some policy or other, they are quietly ignored when not. We hear it in the film, as the financial institutions are rescued by the public purse. But this bailout of the banks was only a particularly noticeable manoeuvre of this ilk. ‘The state’ keeps cropping up throughout the film. Those who would tear down all fences also often subscribe to the notion that the state is necessarily the enemy; that it is constituted power, rigidly oppressing the natural energy and flow of the constitutive. (There are resonances here with de Certeau’s sharp distinction between the spaces of power (bad) and the little temporal tactics of the resisters.) It is yet another thread in the debate over horizontalism. Even in this landscape of privilege (on the whole) that Robinson investigates, the state is an ambiguous presence. In this soft and gentle countryside of the Home Counties the state as the military is massively present, and is aggressive and excluding. But then, we seem to be asked to bristle at the privatisation of so many public assets (state stewardship would be better). The ‘community’ near the car works, blighted by unemployment, child poverty and sickness, and modelled as ‘Together’ in heterosexual family form by a local artist, elects members of the Independent Working Class Association and resolves, in the face of cuts, not to plead for the state to come back but ‘to fill the void both socially and politically’. Yet it is the public sector that must step in as the financial crisis deepens. On the one hand the military state keeps its enclosures enclosed, on the other Newbury District Council opens up Greenham Common once again to public access. What is at issue, it seems, is the form of the state and to whom that too belongs. 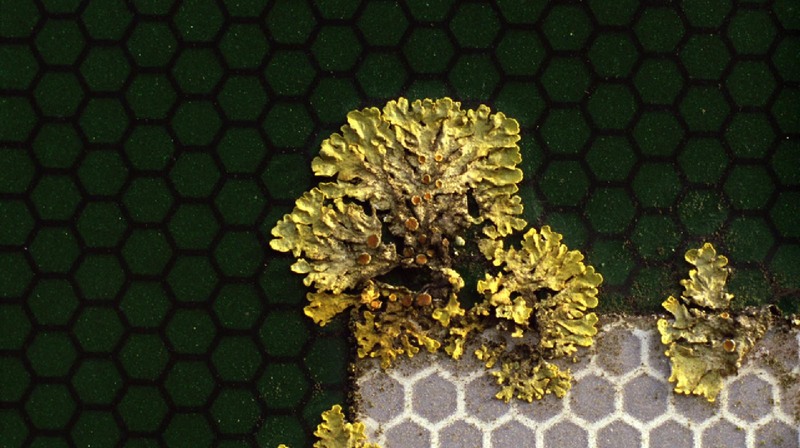 And returning to the lichen which pointed him on his way Robinson muses upon the possibilities of mutualism. Anyway, what was created in the early nineteenth century in England was a national labour market. Or that was the intention; the resistance to movement, whether for social reasons of place-basedness or of economics – maybe you can’t afford to move from the North to live in the South East – remains pervasive. The mixture of derision and hostility in which Norman Tebbit’s exhortation to get on your bike is held is telling. Why should ‘labour’ (only fictitiously a commodity) move at capital’s behest? This could make one think a bit differently about international migration. One of the places from which this project started was a curiosity about the amount of cultural and critical attention given to experiences of mobility across the world. The comparative lack of attention, from the commentators’ bases in ‘first world’ cities, to rural-urban migration in the global South is notable. It is a vast process of displacement, mobility, and cultural disruption. It has been estimated that two billion people (one third of humanity) are currently moving from rural to urban areas (Pearce, 2010). This is the creation of markets on a global scale, uprooting people from previous more complex modes of survival, and their transformation into free labour. Inter- and intra-national migration go together: a vast reorganisation of human beings into a new, potentially global, market for that fictitious commodity ‘labour’. There are those, as in the nineteenth century, who hail this as progress for humankind: ‘this last great migration [is] “a force for lasting progress, an end to poverty, a more sustainable economy, a less brutal existence”’ (Pearce, citing Saunders, 2010). And as in the nineteenth century also, there are those (such as Davis, 2006) who document the suffering involved. Either way, one might note, once again, Polanyi: ‘To separate labor from other activities of life and to subject it to the laws of the market was to annihilate all organic forms of existence and to replace them by a different type of organization, an atomistic and individualistic one’ (p. 171). But labour and land are not the only aspects of our existence that an ambitious capitalism has fictitiously commodified. Two great arching crises shadow the film: crises of finance and of ecology. Neither can be simply detected in the images. Here it is two sets of juxtapositions that do the work – or, better, ask us to do some work: the juxtaposition of image and voice, and the juxtaposition of temporalities. In the text that Robinson had been reading, Polanyi had already written, in the context of the debate about the Gold Standard, about the commodification of money. It was the third of his three fictitious commodities. But less than half a century later, from the 1970s onwards, a whole new wave of financial commodification began to take hold. The post-war social-democratic settlement that had been negotiated, in some countries at least, was under challenge, not least from the gains that had been made towards narrowing inequality. The gains made by labour, and its growing sense of entitlement and its organisational strength, were threatening the profits of capital. What emerged, as we know, was a neoliberal globalisation underpinned by a rhetoric of free trade, market forces and privatisation, and a hugely dominant finance sector. As profits from investment in non-financial production sectors declined, this expanding finance sector looked instead to assets (land and property, commodities, and finance itself) as an opportunity for profit. That is, its money went not into production of new things but into bets on existing things in the hope that prices would rise. And rise they did, contributing to the massive redistribution upwards towards the already rich that occurred all over the world but which was especially marked in those countries that had most enthusiastically adopted this ‘neoliberal’ model. Thus was created that stratum of the super-rich that Adonis and Pollard see as being ‘as critical as the rise of the gentry before the English Civil War’ (see above). While there was, indeed, much comment on the grossness of all this, and in spite of the widening inequality, most people kept quiet, and kept spending. For the regressive redistribution was covered over for a while by credit, a borrowing spree throughout the population that allowed those not amongst the super-rich to continue to consume. The precariousness of it all was made brutally evident when the ‘sub-prime mortgage market’ (a technical term that erases the structural social conflict that underlay it) crashed in the USA. All that is a well-known story. Chief among the commodities that were invented to be traded in this way were, of course, derivatives. Through them, uncertainties and risks were separated off from the underlying material assets, and also from their social and political contexts; they were ‘repackaged, made commensurable with new things, mathematised, “liquified” and sent through commodity circuits’ (Lohmann, p. 7). As Lohmann argues, just as did the commodification of people and land in the eighteenth and nineteenth centuries, this new wave entailed social transformation. Just as land and people had to be made commensurable and mobile (tradeable), to be transformed into real estate and labour, in order to be exchangeable on a market, so too risk and uncertainty had to be universalised and mathematised into a ‘thing’ that could be traded around the world. (Once again territory and flow are mutually constitutive.) One risk had to be made measurable against another. So the same forces that provoked the anger of Bartholomew Steer and the rioters of Swing lie behind the financial frenzy, and collapse, that counterpoints those stories through the narrative voice of the film. And crucial to this process of making things liquid, of freeing them to flow, was disembedding them from the specificity of the world on which they were, ultimately, based. Disembedding them, in particular, from the particularities of the material landscape, the place, on which in the end they depended. Indeed, the commodity ‘land’ (and property) was crucial in this dynamic too, and in its collapse. The sub-prime saga is iconic evidence of that, but so is the fact that in the UK, the US, Ireland and Spain homes became houses became real-estate became buy-to-let (and the inequality increased yet further), and so too the spectacle of postmodern urban regeneration (city centres only) around the world, to house and celebrate the newly rich. Land and property, and the derivatives that were calculated out of them, were assets everyone wanted. Multinational corporations, and states too, bought up land in continents they barely knew. It was a spiralling out of control of that first move to make land a (fictitious) commodity. It was fuelled by, and further fuelled, the credit cycle. In Latin America, battles over landownership, and especially over alternative forms of landownership (collective, private, common…) have long been central to the larger historical struggle. At issue, as ever, is that question of belonging and its awkward partner ownership. The drive towards commodification, and the search for places in which to turn a profit, is relentless. Swings in the prices of food and energy, especially wheat and oil, track through the film. The Speenhamland system was pegged to the price of bread. As we meet a field of standing wheat we are told that its price had doubled and that there had been bread riots in Egypt. That was in 2008. As I write this in 2010, a headline reads ‘Global food crisis looming, UN is warned’ (Vidal, 2010). In 2007-8 a near doubling of the price of many staple foods led to rioting in more than 30 countries. This month there have been riots in Mozambique. In the capital, Maputo, people have taken to the streets and burned tyres and looted shops. Bread prices there have gone up by 30%. Police fired on the demonstrators. ‘Up to 10 people have died so far’ (Guardian, 3rd September, 2010, p. 7, from Reuters Maputo). The Food and Agriculture Organisation reported in June 2009 that over 1 billion people were chronically malnourished. The title of the report was ‘One sixth of humanity undernourished’ (FAO, 2009). There are many causes for these swings in food prices, and volatility itself is as much of a problem (for the small producers around the world) as the rises are for those who need to eat. There is the weather, though you can buy a derivative (a weather derivative) and bet on that risk (Pryke, 2007). There is the shift to biofuels. But central to the new volatility is speculation in commodity index funds (WDM, 2010). It is these, not food itself, that are the commodities that are bought and sold. ‘Disembedding’ again. Back in the fields themselves, we watch a machine harvesting wheat. We are told of the history and uses of the crop. We are told also of the calculations that have to be done if this crop is to be economically viable: ‘The better-prepared had pre-sold part of their crop already, when prices were higher, earlier in the year’. This is the local farmer joining in the commodification of risk. It is more than a story of economic calculation though; it’s about the material enrolment of a people (here a farmer) into finance’s logic of life. It alters the landscape; it shifts the way the farmer – and perhaps we – see the fields. It is the extension of a view of the world, a changing of heads, the deepening of a hegemonic ideology. (There was such a farmer on the radio this morning. He had already sold some of next year’s crop, not planted yet. If there’s going to be a global food shortage… He said he was fed up – if you don’t sell and the price goes up you kick yourself; if you do sell and the price goes up you wish you’d sold more. What he wanted to be was a farmer.) All this as the machine comes back, again, carving through the standing grain. These fields, I happen to know, are in the villages around Otmoor. The camera gives us time, if we will, to continue the stories of Otmoor and Swing, to the present financialisation of our imaginations, and to Maputo, Mozambique. Landscape as stories-so-far. And there is one more thread to the story. In Oxfordshire the combine harvester runs on oil, and the farming is fed, as the narrator tells us, by fertilisers (most likely based on oil) and fuel which must be paid for. And prices are rising. In Mozambique, the immediate cause of the protests was the rise in the cost of bread. But that came after rises in the price of electricity and water. ‘The action on the streets isn’t simply a protest about food, but a wider act of rebellion’ (Patel, 2010). And it is bound up with climate change. The fires raging in Russia had sent wheat prices up still further. As Patel argues: ‘Look…to the deaths and burning tyres in Mozambique’s “food riots” to see what happens when extreme natural phenomena interact with our unjust economic systems’. His title is: ‘Mozambique’s food riots – the true face of global warming’. And how is it proposed that we address this? From big business, from the financial sector, from the governments of many of the richer nations of the world (and some others too), from what Lohmann calls ‘middle-class environmentalism’, has come an answer. Let’s create yet another commodity. Carbon. We could make it tradeable. Carbon markets! A leaked document suggests…that one reason that the British government is reluctant to pursue renewable energy targets is that they would threaten EU ETS carbon prices and the survival of the London financial district’s growing carbon trading industry (Lohmann, p. 37, citing Environmental Data Service Europe Daily, 2007). Just one more riff on this disembedding question. To say that things are disembedded from the particularity of their original existence does not mean that the mobile thing created (labour, derivatives, carbon) becomes entirely free-floating. On the contrary; they are re-embedded in other realities and other discourses that once again constrain and further mould them. In the theories of neoclassical economics, in the reality of carbon markets, in neoliberal economic policy. And in our framing imaginations of the world, in which everything is exchangeable and has a price. Maybe this context is important in explaining the current cultural and social scientific obsession with liquidity and movement. It chimes with the times. It chimes also with the economic dominance of finance, and the tales of neoliberal globalisation. Returning to the soil might seem to be to go to the opposite end of an imaginary spectrum. It might evoke that opposition from which this essay began, between mobility and a Heideggerian notion of dwelling, and the dissatisfaction with it that was one of the provocations from which this project took off. Yet one of my instinctive practices when thinking about a particular place is to get out the geology map. It was thus that I found myself tracing the intermittent outcrops in our area of a sometimes rubbly limestone called Cornbrash. Let us for a moment pause and, as with other stories in this landscape, give Cornbrash its due. The name itself is arresting, unlike some of the more scientific-sounding names of many geological strata. It is the old name, coined by William Smith (1769–1839), the ‘Father of English Geology’, who made the first national geological map. It was Smith who first understood the connection between fossils and the strata they were in and thus revolutionised the spatio-temporal dimensions through which landscape might be imagined. Smith was not, however, a member of those social strata who owned the land the formation of which so engaged his enquiries and imagination. Nor was he of those gentle social strata who collected fossils for display in cabinets, nor easily at home among the established gentlemen who were to found the first Geological Society in London. He was not among those invited to join this founding group. And for years his work was plagiarised and his contribution disregarded. As Winchester notes: ‘Smith was not alone in regarding himself as a victim caught in the crossfire of a British class war’ (2002, pp. 202-3). Smith worked on the ground. And the ground was opened up to him and his imagination by his engagement in the new industrial advances of his time. As a surveyor he plotted routes for the digging of canals, investigated the complexities of rocks in newly opened coal mines, and worked on drainage schemes for landowners who had newly enclosed the fields and wished to improve them. He learned from colliers and quarrymen. (In the film, the limestone quarry, by the cement works where Robinson had his ‘experiential transformation’, had been known for its fossil reptiles since precisely this period. Maybe William Smith knew of it…). It was, according to Winchester, during the late summer and autumn of 1795, the year of Speenhamland and the changes to the laws of settlement, and while he was working on the Somerset Coal Canal, that Smith put together his revolutionary understanding of the geology of the landscape. And the stratum he called Cornbrash is an important datum in this geological understanding for though only thin it can be traced from Dorset to Yorkshire, and even further afield (Wells and Kirkaldy, 1959, p. 257). But to return to the name. William Smith called it Cornbrash because you could grow good corn on it (Toghill, 2007, p. 138). There is much corn in the film. I telephoned Patrick. ‘Where, exactly, was that first full shot of ripening wheat taken?’ Following the film I had an idea where it might be: there was a little string of inliers of Cornbrash running north-east from Islip, somewhat to the north of Otmoor. ‘Noke’, replied Patrick. The wheat seemed to be on Cornbrash, but we couldn’t be sure without finer detail. We went exploring. In the end we spent ages, with geology maps of different scales, a host of books, and in the landscape itself, trying to pin it down. And I’m still not absolutely sure if that particular field is precisely on the Cornbrash. What interests me now is why it seemed to matter so much. Partly it was the simple fun of the chase. Partly, maybe, there was an element of wonder at the serendipity – or perhaps in more theoretical terms the psychogeographical coincidence – that our method had thrown up. But more than anything else, there was something deeply satisfying about the possibility of such a continuity in the human-nonhuman relation. Philosophical and political warning lights immediately flash. Is this a return to the soil in the sense of rootedness, authenticity, and all those evocations of the eternal cycles of dwelling that we have learned so well to reject? The power of the nonhuman is strong in the film. It’s in those long concentrations: the cowslips, the lords and ladies, the teasels. Perhaps above all the white foxglove. These passages of film force you to look. What’s more, these moving images do not give me ownership. Quite the opposite. They force me to submit, to the foxglove’s implacable otherness, to its vulnerability to human actions, yes, but also to its utter indifference to us – to the camera, to the person behind the camera, to us watching the film. The other side of the vulnerability, and the danger of anthropogenic ecological collapse, and counterpointing the marginality of the locations to which these plants have been restricted, is, perhaps, the marginality of the human in relation to the planet. The rubbly Cornbrash was laid down about 175 million years ago, on a planet already more than 4,000 million years old, in the geological period we now call the Jurassic. William Smith was born on the Jurassic, at Churchill in Oxfordshire (‘among the small muddle of warm-coloured stone cottages, with their thatched roofs and climbing roses, with the village green and the inn and the duckpond and the old steepled parish church’: Winchester, p. 20) and the rocks of this period were his great love and the spark to his re-imagination of the history of the landscape. It is also the Jurassic that marks that distinctive swing in the geological map of the country, from south-west to north-east, from Exe to Tees. The Tees-Exe line is the real boundary line between North and South in England, the marker of the North–South divide. To north and west the rocks are older, more complex in their pattern, many of them contorted and metamorphosed. To the south and east the layers of younger sedimentaries slope away in smooth chronological order. It is on the latter side that lie the nationally iconic rocks, in this arable southern and eastern England of the post-Carboniferous. Indeed, when these layers of the Jurassic were deposited, the land that is now this country was even further south (at about 35° north of the equator) and just an indistinguishable part of the supercontinent of Pangea. Pangea itself was slowly drifting northwards and beginning to break up. In a nice touch, given the focus in the film on subordination to the USA, it was in the Jurassic that something that would come to be called the Atlantic Ocean began to open up. It began in the south, leaving the well-known fit between the coastlines of South America and Africa. The north Atlantic began to split open in the Cretaceous, the period of chalk, the rock of the Ridgeway. So what? Well, in the context of the present exploration it could provoke two ruminations. First, it reinforces the argument that the whole notion of landscape produces a smoothing effect. Beneath these settled acres lies a history, encoded in the rocks, of force and movement and crashings and riftings of an immensity almost unimaginable. And second, and following on from that, it tells us that there is no recourse to a settledness, no final still point. That nature itself is no secure foundation. In some ultimate way, this going back to the soil ironically itself problematises such a notion of rootedness. What does it mean to say, as is so often said, that there used to be crocodiles in Oxfordshire (the crocodiles whose fossilised remains are now to be found in a quarry at Shipton-on-Cherwell)? What’s Oxfordshire here? Indeed, where is here? Landscape in that wider sense is provisional. It changes and it could be otherwise. Those pieces of film that linger on cowslips or foxglove aim to awaken us into imagining the possibility of a landscape that is different. During the middle Jurassic, when the oolites were laid down, ‘Oxfordshire’ and ‘Berkshire’ and other parts of southern England were covered by a shallow warm sea. Reading descriptions of this sea, and exploring the paleogeographic map of the period put me in mind of Patrick’s frequent references during our project conversations to a book by Richard Jefferies – After London: wild England (1885/1980) – in which, also, much of southern England is under water. For Patrick one of its main attractions lies in the notion of a fictional geography – the idea that the landscape could be otherwise. In the 1980s, in dismal moments after the defeat of the miners and of the urban left, some of us used to think that only the gradual compensatory sinking of the south-east of England, as the north-west of Great Britain recovered from the great weight upon it during the Ice Age, might serve to rid us of Thatcherism, so much a product and expression of that south-eastern triangle. But I’d always been nagged at in this reverie by the fact that London would be the first to go. For Jefferies London was the centre of noxiousness and corruption. The waters above the sunken city are putrid and bubble with contamination. But the London of the 1980s, as well as being the centre of a resurgent and soon-to-be dominant financial capitalism was also, as it had often been, a place of rebellion (Bartholomew Steer wanted to link up with the London apprentices). Jefferies’ fictional geography seemed a questionable retreat rather than the proposition of a progressive alternative. So when I found a map of the paleogeography of the middle Jurassic it made me smile, for ‘London’, in all its socio-political ambiguity, is saved from the waters (though of course it doesn’t yet exist) by being on a then upstanding part of the Anglo-Brabant landmass. And this landmass in turn had been formed, some 200 or so million years previously, during the great mountain-building period that occurred with the crashing into each other of Laurentia and Avalonia. Only then were the two parts of what were to become the British Isles (roughly north and south of middle Ireland and the Solway) brought together. Before that they had drifted quite separately, on different continents, around the surface of the planet. And now of course we are faced with a marine invasion of a different provenance and London must shore up its sea defences. Jefferies was writing at a time when others were looking back in a different way, linking a recognition of a popular, and radical, past with the possibility of a better future. This is what the landscape gives us. When we set out on this project, New Labour’s proposition had been the reverse. They were hammering home a constant counterposition between old and new. Old and New Labour, old and new everything. Old was bad. ‘Modernisation’ (apparently a singular thing) was the way. There was no learning positively from the past, certainly not the popular past. This project’s way of engaging with landscape proposes the opposite: the landscape is stories that speak to today. Blair’s rhetoric of Modernisation, moreover, insisted it was the only way. Thus were the contemporaneous multiplicities of the spatial squashed into a single temporality. Other possible roads were closed down in the insistence on an inevitable future. It was of course a cosmology inherited from Margaret Thatcher: that There Is No Alternative. And it continues as George Osborne and co. assure us that they do not want to do this, as they slash and burn through the fabric of society, but they have no alternative. Such reductions of the world serve, as always, to cover over the reality that there are always alternatives, and that the way ahead they urge upon us is a thoroughly political choice. And, to return to the project’s initiating provocation, that popular past was not the inward-looking bounded localism so often counterposed to an equally erroneous vision, of a present that is globally open. Bartholomew Steer, the Swingrioters, the people of Otmoor: all were acting in the context of wider connections, influences and debates. It is empirically incorrect, and politically a cul-de-sac, to counterpose a bounded localism against an ungrounded, disembedded globalism. Neither can be the basis for a future on different terms. A real internationalism in the political sense might better stem from a recognition of the multiplicity of local specificities, but where such specificities are themselves open to the wider world. One more story. The radicalism of London in the late eighteenth and early nineteenth centuries included much contact with a Latin America beginning to organise for independence and to find its own voice. One prominent figure was Francisco de Miranda, ‘Precursor of Venezuelan Independence’, who had in a full life been a general in French revolutionary armies, and travelled much of Europe. Now, in those years when the people of Thatcham were gathering their forces in protest, Miranda turned his house in Grafton Way into a base for radical debate, a staging post in that long trade across the Atlantic in rebellious ideas (Guardiola-Rivera, 2010). Simón Bolívar was among many who visited. And one of Bolívar’s sources of inspiration was the philosopher-teacher Simón Rodríguez. He too travelled to Europe, having lost his teaching post through his insistence on including in his classes the poor and the indigenous. It was Rodríguez who coined the phrase now resounding again in Latin America: o inventamos o erramos (either we invent or we lose our way). It is a politico-geographical reflection: we must learn widely but in each place we must build something specific. While Rodríguez travelled in Europe, engaged in this wider learning, he adopted a new name: Robinson. At one point in the film our Robinson wonders if some ‘larger, historic shift’ might be occurring. The state had had to intervene ‘on such an unprecedented scale’ that, maybe, the very tenets of neoliberalism might now be put in doubt. There was indeed a moment in the UK, while the project was in process, in which it seemed there might just be a fracturing of the hegemonic common sense – about the inevitability of competitive individualism, about the ideology of self-interest that had brought about the crisis, perhaps a challenge to the very way of being human. The moment passed. But shifts between social settlements last decades. It took from the seventies until the late eighties for the struggle to be resolved over what would succeed the post-war social democratic settlement. It was to be finance and neoliberalism. After 30 years that too fell into crisis. And there will be no way out on Robinson’s terms, it seems, without challenging those underlying tenets. The common sense that underlies our daily discourse, that frames our understanding of the world, and of what is possible. Robinson pays attention to the foxglove and the teasel. He notes that we have raised to the status of a force of ‘nature’ the very markets that have brought about our downfall, while undermining through our disregard for ‘real “nature”’ the very possibility of our continuing existence on the planet. Likewise, for Robinson the way out is not to be found through that process which tracks the film, of the commodification of everything: land, labour, risk, carbon… Down those failed roads, if one wants a different world, we shall, he seems to hint, only provoke again the despair of Bartholomew Steer that we shall ‘allwaies live like…slave(s)’. 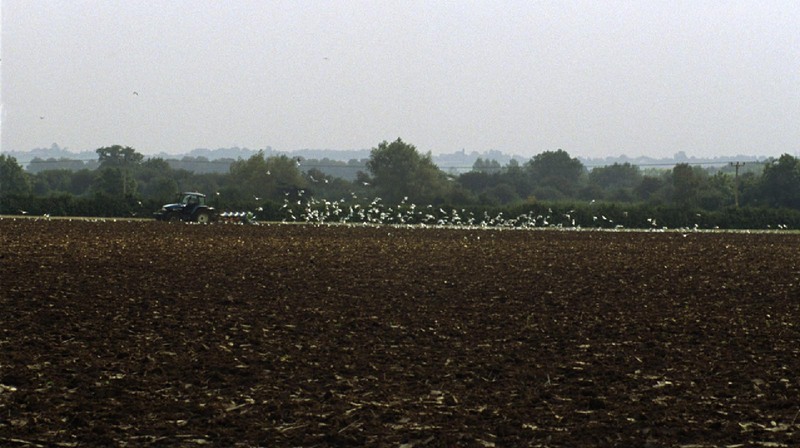 This essay was written as part of an AHRC-funded research project: The future of landscape and the moving image [AH/E510566/1] with Patrick Keiller and Patrick Wright, and with Matthew Flintham. It is part of the AHRC’s Landscape and Environment programme. I should like to thank Sheree Barboteau of the Open University for her help with the technical production of the essay. Adonis, A. and Pollard, S., 1998, A class act: the myth of Britain’s classless society, London: Penguin. Althusser, L., 1970, ‘The object of capital’, in L. Althusser and E. Balibar (eds), Reading Capital, London: New Left Books, pp. 71-198. Bergson, H., 1910, Time and free will, Muirhead Library of philosophy (authorised translation by F. L. Pogson), London: George Allen and Unwin. Bergson, H., 1911/1975, Creative evolution (trans. A. Mitchell), Westport, CT: Greenwood Press. Boundas, C.V., 1996, ‘Deleuze-Bergson: an ontology of the virtual’, in P. Patton (ed. ), Deleuze: a critical reader, Oxford: Blackwell, pp. 80-106. Cobban, A., 1965, A history of modern France, volume 2: 1799-1871, 2nd Edition, London: Penguin. Davis, M., 2006, Planet of slums, London: Verso. De Certeau, M., 1984, The practice of everyday life, Berkeley, CA: University of California Press. Donald, J., 1999, Imagining the modern city, London: Athlone Press. Eagleton, T., 2010, ‘Washed in milk’, London Review of Books, 5th August, pp. 10-11. Environmental Data Service Europe Daily, 2007, ‘Leaked note reveals UK’s renewables angst’ number 2373, 15th August. Flannery, T., 2005, ‘Monstrous carbuncle’, London Review of Books, volume 27 (1). Friedman, T. L., 2006, The world is flat: the globalized world in the twenty-first century, London: Penguin. Guardiola-Rivera, O., 2010, What if Latin America ruled the world?, London: Bloomsbury. Hardt, M. and Negri, A., 2004, Multitude, New York: Penguin. Hardt, M. and Negri, A., 2001, Empire, Cambridge, MA: Harvard University Press. Harvey, F., 2008, ‘Carbon trading set to dominate commodities’, Financial Times, 26th June. Hobsbawm, E. and Rudé, G., 1969, Captain Swing, London: Lawrence and Wishart. Hobsbawn, E., 1962, The age of revolution: 1789-1848, London: Abacus. Hunter, A. and Easterbrook, G., 2004, The geological history of the British Isles, Milton Keynes: The Open University. ISER, 2010, ‘Social mobility in England still lagging behind rest of world’, ISER News, Summer, p. 1. Jefferies, R., 1885/1980, After London: wild England, Oxford: Oxford University Press. Kanter, J., 2007a, ‘Carbon trading: where greed is green’, International Herald Tribune, 20th June. Kanter, J., 2007b, ‘In London’s financial world, carbon trading is the new big thing’, New York Times, 6th July. Kaplan, C., 1996, Questions of travel: postmodern discourses of displacement, Durham, NC: Duke University Press. Linebaugh, P. and Rediker, M., 2000, The many headed hydra, London: Verso. Lohmann, L., 2009, ‘When markets are poison: learning about climate policy from the financial crisis’, Sturminster Newton, Dorset: The Corner House. Massey, D., 2010, ‘The political struggle ahead’, Soundings: a journal of politics and culture, issue 45, pp. 6-18. Massey, D., 2007/2010, World city, Cambridge: Polity. Massey, D., 2006, ‘Landscape as a provocation: reflections on moving mountains’, Journal of Material Culture, volume 11 (1/2), pp. 33-48. Massey, D., 2005, For space, London: Sage. Massey, D. and Catalano, A., 1978, Capital and land: landownership by capital in Great Britain, London: Edward Arnold. Patel, P., 2010, ‘Mozambique’s food riots – the true face of global warming’, Observer, 5th September, p. 29. Pearce, F., 2010, ‘Streets ahead: review of Saunders, 2010’, Guardian, Review section, 18th September, p. 7. Polanyi, K., 1944/2001, The great transformation: the political and economic origins of our time, Boston, USA: Beacon Press. Pryke, M., 2007, ‘Geomoney: an option on frost, going long on clouds’, Geoforum, volume 38, pp. 576-588. Saunders, D., 2010, Arrival city: how the largest migration in history is reshaping our world, London: Heinemann. Toghill, P., 2007, The geology of Britain: an introduction, Marlborough, Wiltshire: Airlife. Thompson, E.P., 1968, The making of the English working class, London: Penguin. Vidal, J., 2010, ‘Global food crisis looming, UN is warned’, Guardian, 25th September, p. 19. Walter, J., 1985, ‘A “rising of the people”? The Oxfordshire rising of 1596’, Past and Present, number 107, pp. 90-143. War on Want, 2010, Up front: women at work, London: War on Want. Wells, A.K. and Kirkaldy, J.F., 1959, Outline of historical geology, 4th edition, London: George Allen & Unwin.WDM (World Development Movement), 2010, The great hunger lottery: how banking speculation causes food crises (by Tim Jones), London: World Development Movement. Williams, H., 2006, Britain’s power elites: the rebirth of a ruling class, London: Constable. Winchester, S., 2002, The map that changed the world: a tale of rocks, ruin and redemption, London: Penguin. Wysham, D., 2008, ‘Carbon market fundamentalism’, Multinational monitor, volume 29 (3). The title of an international bestseller by Thomas Friedman (2006). The full title is The World is Flat: the globalized world in the twenty-first century. There is also, of course, a deeply embedded gender politics here. The argument here is not that the static camera achieves this argument more effectively than would a moving one. The distinction being drawn upon is between a still and a moving image. (Though the stillness of the camera does perhaps emphasise the in-place nature of this becoming, as against the frequent current practice of eliding becoming and spatial mobility – see below.) It is also the case of course that still images (photographs, for instance) frequently imply, depict or evoke moment: they themselves are not simply ‘still’. There can be a self-reflectiveness that precisely says: this is a moment in a story. However, neither this nor the point that films are themselves compiled of a sequence of stills counters the point being made here, for films are not material landscapes. This argument is also made by Althusser in his critique of the synchrony/diachrony dualism (Althusser, 1970). Correlatively, the temporal is imbued with spatiality. The two dimensions are not counterposed but mutually constitutive. For this larger argument, see Massey, 2005. This philosophical characterisation of space as a surface of course also ignores those more multi-dimensional imaginations of space, in terms of volume for instance. The dichotomous opposition between power and resistance should also, incidentally, be questioned. I had felt, as we meandered through the villages, that this antipathy might be articulated, not only by class, but also through the North–South divide. That in the countryside of the North I do not feel so outside. Class and geography are thoroughly intertwined. But my sister had been that very day in a part (like many parts) of the Lake District where the majority of the population were new offcomers (as they call them there), in done-up houses, with more than one car, including a 4×4, though they moan – as an excuse – about the lack of public transport (which they wouldn’t use even if it ran every quarter of an hour), and the closure of the local shop (which they didn’t use either). It’s not simply a matter of North and South. Sir Peter Lampl, Chairman of the Sutton Trust, cited in ISER, 2010. It was ISER (Institute for Social and Economic Research) that produced the report. One might also question the meagre goal of ‘social mobility’ in a society that, structurally, is becoming increasingly unequal. You may be aided to climb the ladder (with all the dislocation and displacement that will bring) but we won’t address the steepness of the ladder. None of which is to imply that everyone who likes neogothicism is reactionary. In 1595 there was serious disorder in the capital, sparked by food riots. Indeed in 1596 the Oxfordshire authorities, worried about the grain shortage, had tried to keep home-grown grain within the county but ‘had been overruled in the interests of London by a government mindful of the disorders in the capital the previous year’ (p.98). This in turn, presumably, exacerbated the shortages in Oxfordshire. We could do with some joining up of struggles in different regions right now (Massey, 2010). The article by John Walter was one of a number of pieces we circulated and discussed within the project. It was only later, though, re-reading it alongside a map and the script, that I was struck by the significance (the possible significance) of the B4027. Patrick Keiller had never spoken of it in this way, though he had vaguely implied some happenstance of fascination with the road. So maybe I’m making this connection up, though I want to make it anyway. It was with a mixture of delight and exasperation that I followed the thread. The masque of anarchy, 1819. As we shall see, this is a condition not as specific to the English as Shelley implied. Especially, perhaps, in the global South it is crucial. Lafayette, of course, was the Commander of the National Guard, ‘distinguished relic of 1789’ (Cobban, 1965, p. 94), and symbolic heart of the July revolution in Paris in 1830. The background arguments to the ideas in this section can be found in Massey, 2005. There, I was trying to reconceptualise space, just as this film reconceptualises landscape. The two projects happily intersect. This smoothing effect of ‘landscape’ became a thread of discussion in the project. Responding to my raising it from a spatial/geographical perspective, Patrick Keiller wrote: ‘I’m encountering something similar while working with the camera…[I] wonder if one of the things that people find attractive in images of landscape…in film and cinema is that they offer illusory homogeneities of various kinds.’ This, he said, influenced the way he went about filming. In particular, in relation to the argument I’m making here, he wrote: ‘This suspicion of the reconciliatory aspect of images may become important for narration…I’m making longer takes than I have previously, as I imagine there will be quite a bit to say about them.’ Exactly. These are the stories that puncture the surface of the landscape. I responded by wondering ‘if it’s actually an issue for all forms of representation, simply as representation, insofar as representation is an attempt at capture, at pinning things down’, and Patrick commented on ‘the heterogeneities in any present that are, perhaps, conventionally flattened by representation.’ In this context, the whole idea of landscape is a kind of temporary and precarious corralling of an open multiplicity. In the project discussion referred to in the last footnote, Patrick related this predominance of (relative) close-ups precisely to the difficulty of filming landscape without producing the smoothing effect: ‘In general, I’m increasingly wary of the business of making images of landscape, for the reasons Doreen mentions.’ We shall develop this point later, but I find it interesting that Patrick’s reticence here produced a manoeuvre that coincided with my form of reconceptualisation. It is in this spirit that some cities, for instance, address their own historical economic basis in slavery. For a fuller discussion of the problems with the notion of synchrony, see For Space especially chapters 3, 5 and 11. The story of the manor at Hampton Gay goes on – its future is uncertain and occasionally contested, Patrick tells me – ‘the ruins look as though that’s it, but it’s very far from being it’. In reference to ‘Fay ce que vouldras’, St. Augustine of Hippo’s original homily was an injunction – to love, and do what you will, while Rabelais, as the script tells us, relied as such positions have to on essentialist assumptions about human nature. The Speenhamland system was to prove disastrous for all concerned. In 1834, two years after the landless had been excluded from the franchise in the Reform Act, it was abolished. That left the labourers exposed. Speenhamland has been interpreted as ‘charity’, offered to ward off the threat of claims to equal rights. That charity was now removed. But what stayed in force were the Anti-Combination Laws which forbad the labourers, collectively, fighting for themselves. For consideration of land as a fictitious commodity and an analysis of its pattern and nature of ownership in Great Britain see Massey and Catalano, 1978. Polanyi’s book came out in 1944. This section draws on Larry Lohmann’s brilliant Corner House paper When Markets are Poison (2009). Lohmann spells out the details of this active production. Just to note, women own 1% of the world’s property (War on Want, 2010). In 1973 I was party to a proposal at the Labour Party conference for the total nationalisation of land (they enacted the feeble and unworkable Community Land Act, later repealed)! If calls for the nationalisation of land now seem too far off common currency, the idea of a land tax is creeping back on to the agenda. I am sceptical about this. There is a thread in the film around biophilia and also a commitment to materiality. Robinson believes that he can communicate with nonhuman intelligences and that they have asked him to work on their behalf. We are enjoined to learn from the biosphere (from the lichen’s mutuality perhaps, and there are positive references to biomorphic architecture). But injunctions from a supposed ‘natural’ are inevitably infused with ambiguity. In relation to materiality the ambiguities are endless – the enormous satellite installation on the top of what may be Enslow Hill, where the three accomplices of Bartholomew Steer were hanged, bears witness to the huge materiality necessary for the production of the immaterial. This is not quite Patrick’s view. He wondered if, in its movement from side to side, the foxglove was trying to evade the camera. But he still found he had to let the camera run ‘until the foxglove had finished’. This might give pause to the current human self-absorption, and the overwhelming focus on language and discourse, and (human) meaning. There are often no words to accompany these passages of film. There is no giving in to the temptation to use the very ungraspability to go off on some human-centred story, a vaguely related anecdote, or something about ‘meaning’ for an undefined ‘us’. With some ‘southern’ extensions into the Triassic – Cheshire and the area around Bristol come to mind. For an account of all this geological history see Hunter and Easterbrook, 2004. Misión Robinson is now the name given to one of Venezuela’s many new progressive initiatives in popular education. Grafton Way is now home to the Venezuelan Consulate. the exciting possibilities of this project. I am living in a rural area and always hungry for ideas!